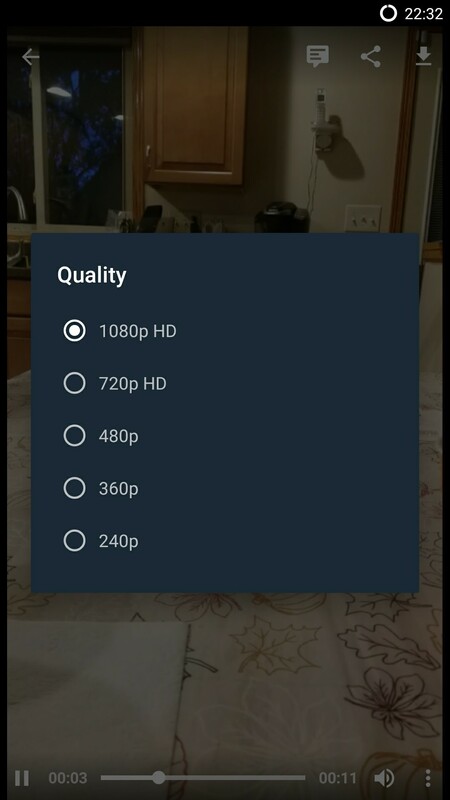 Boost has an option in “Settings-Data Saving” to set the preferred quality for videos (Prefer lower size, Prefer best quality). This setting affects sources that provide different version of videos, like gfycat, giphy, streamable and reddit videos. 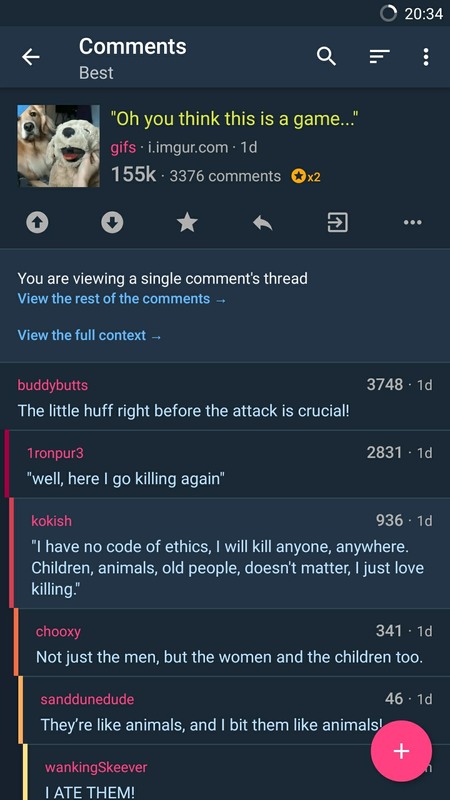 Reddit videos provides qualities from 240p to 1080p HD. The 240p version is crap, and the 1080p may take some time to load. 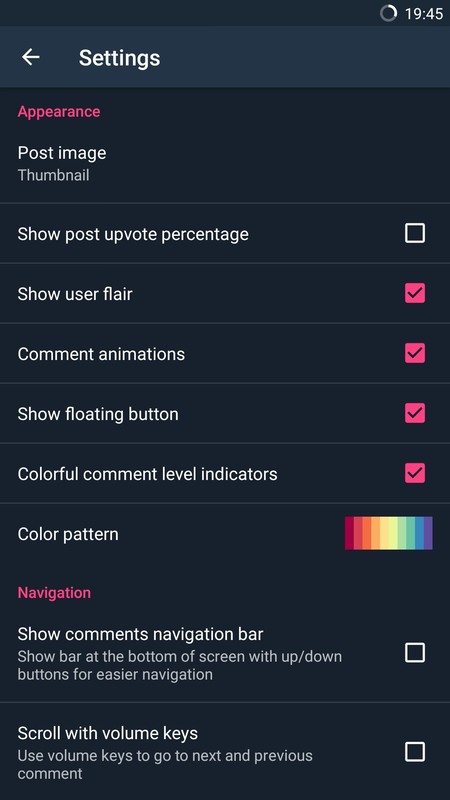 That’s why I’ve added an additional setting for reddit videos to set the mimimum and maximum quality. That way you can have “Prefer lower size” and set 480p as the lowest version, or “Prefer best quality” but limited to 720p instead of 1080p. 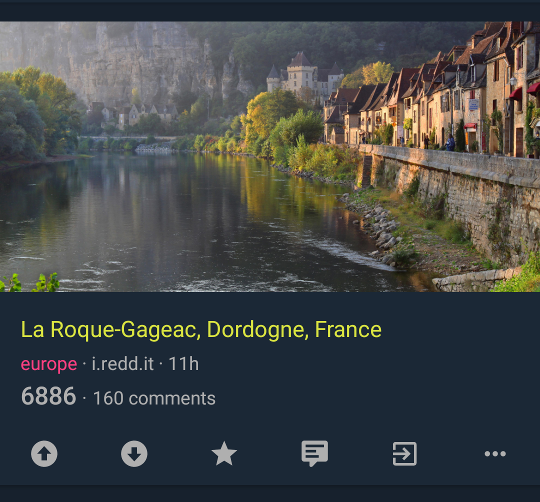 Subreddit headers are only available in the single subreddit screen (the one that opens when any of the “Go to” options is used). 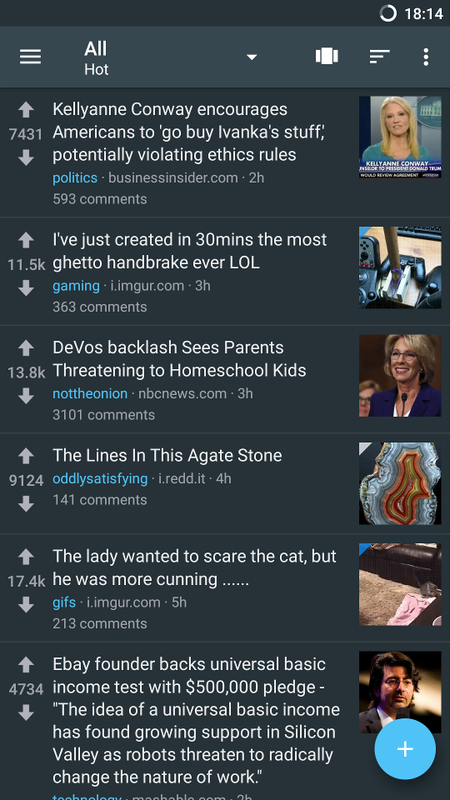 The main screen with the subscriptions dropdown does not load banners since showing/hiding the dropdown when the header is expanded/collapsed would be annoying while switching subreddits. For those who don’t know, on May 28th the app was suspended from the Play store. I appealed the suspension and 8 days later it has been accepted! 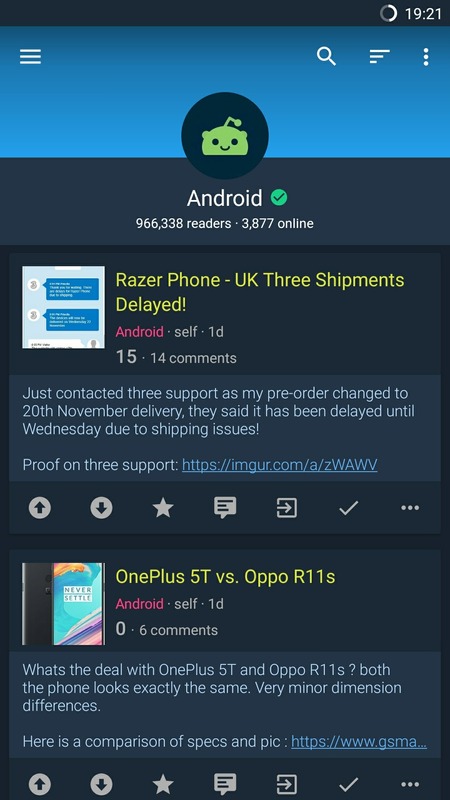 For those wondering, the reason for suspension was a particular post in r/popular that was against Google Play content policies. 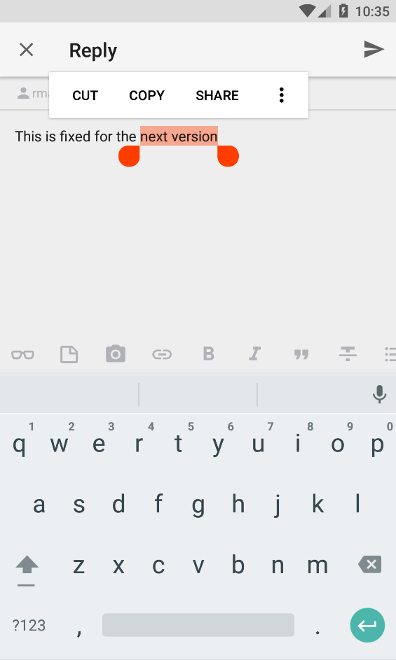 This update fixes a memory leak from the previous version that caused the app to crash after some use. Sorry if I’ve been away from reddit this week, but I wasn’t in the mood. Having your app suspended is not a good feeling. 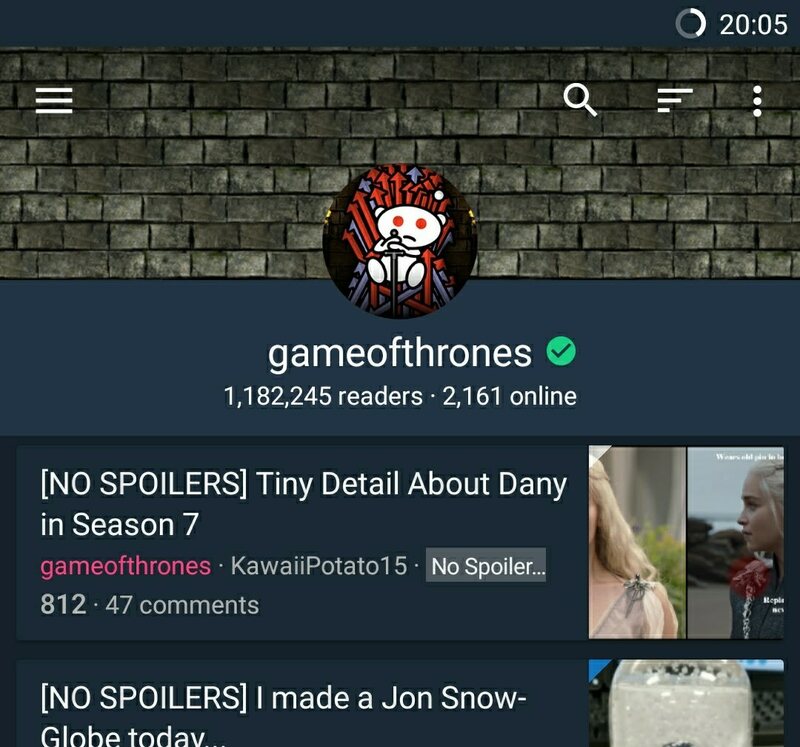 Boost for reddit 1.3.3 has been pushed to the beta channel. 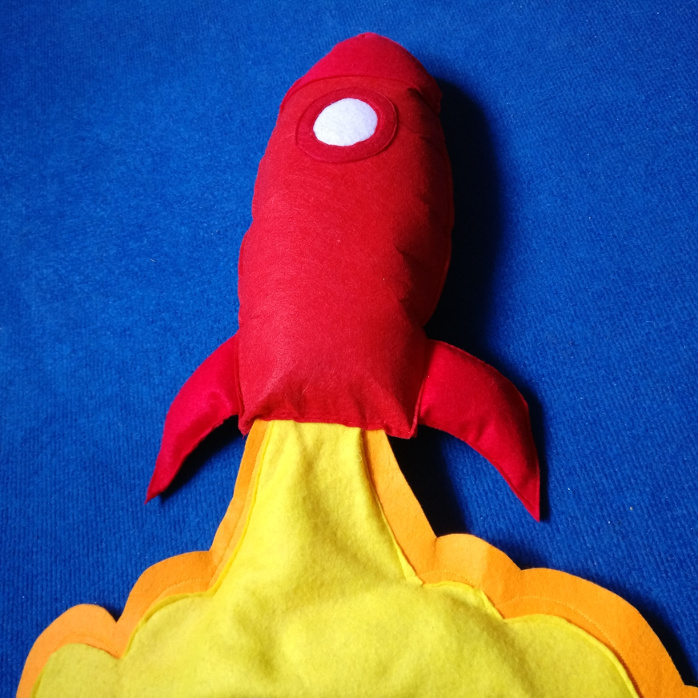 Launch screen following material design guidelines. 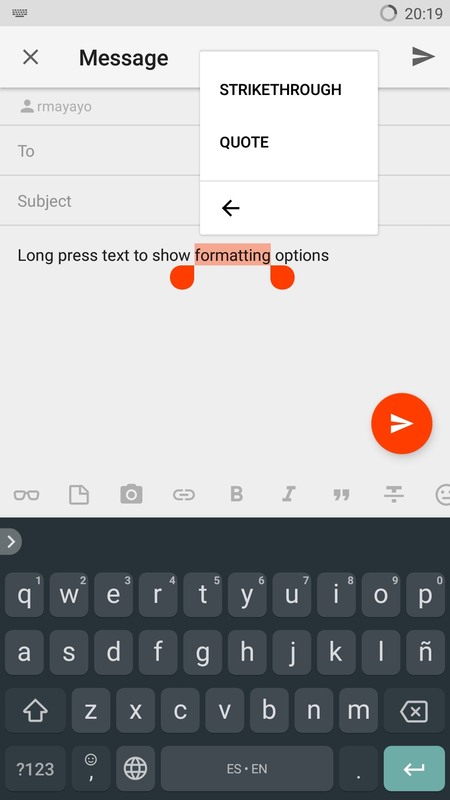 Background color is not customizable cause it is shown before the app is initialized. 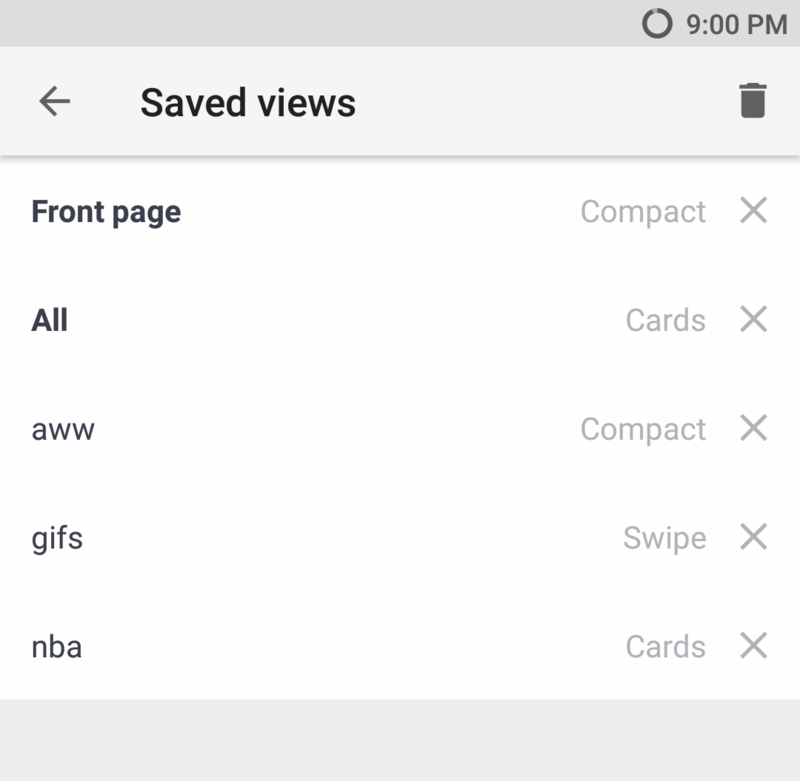 Native ads in the following views: Cards, Cards 2, Compact, List and Mini Cards. 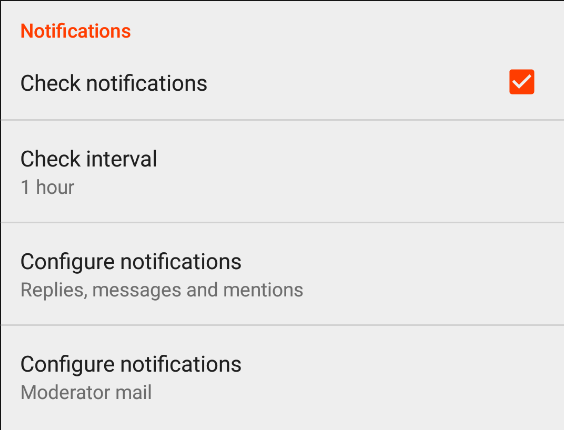 You can revert to banner ads in Settings-About. 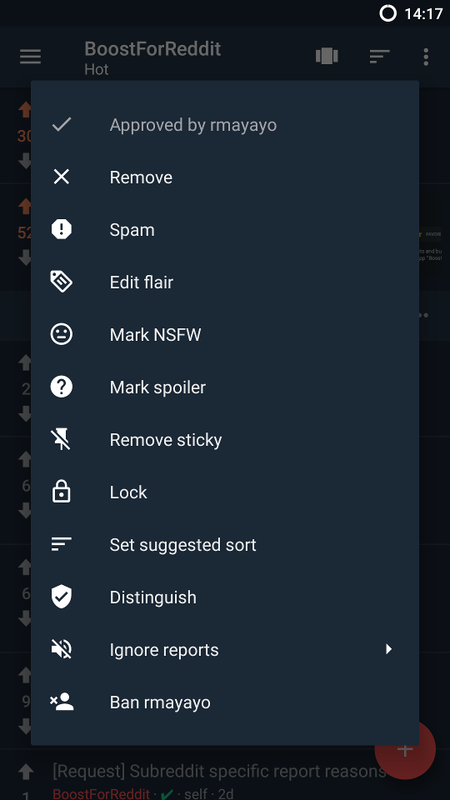 Boost for reddit 1.3.2 – Export settings, Deviant art support, save categories for gold users, new theme options and many improvements! 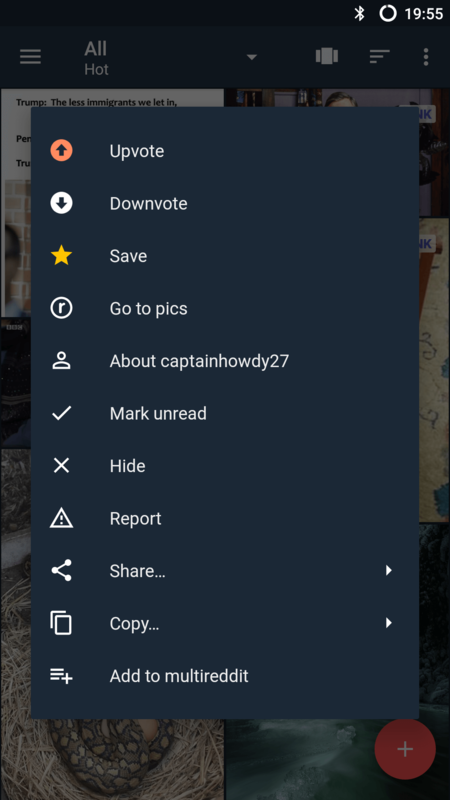 Boost for reddit 1.3.2-beta has been pushed to the beta channel. 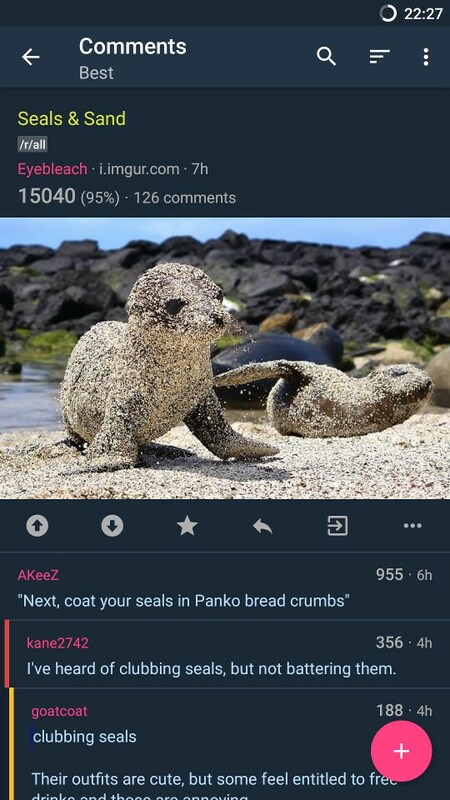 Imported settings will be merged with the current settings. 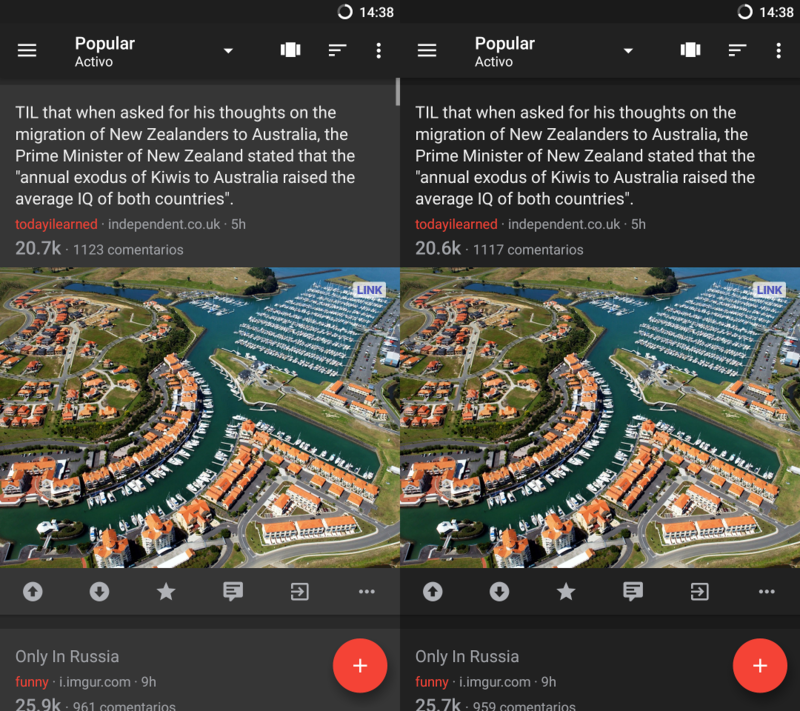 Boost for reddit 1.3.1 – Auto night mode, mute videos, autoplay in swipe view and more! 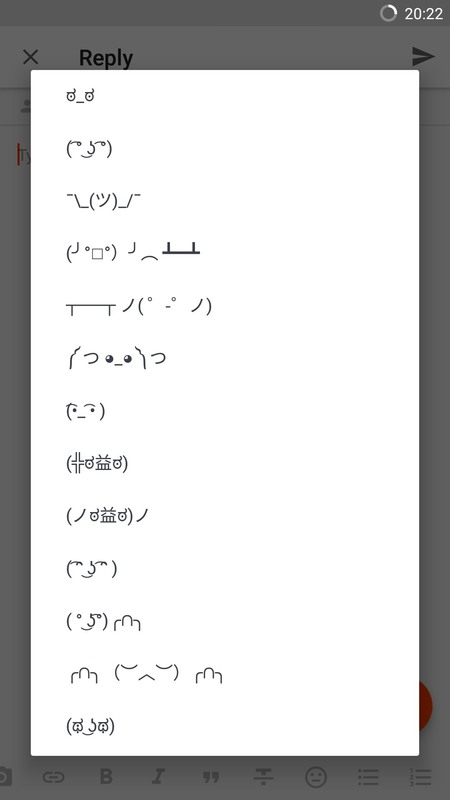 XKCD support. 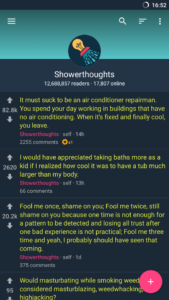 The image alt text is shown in the viewer. 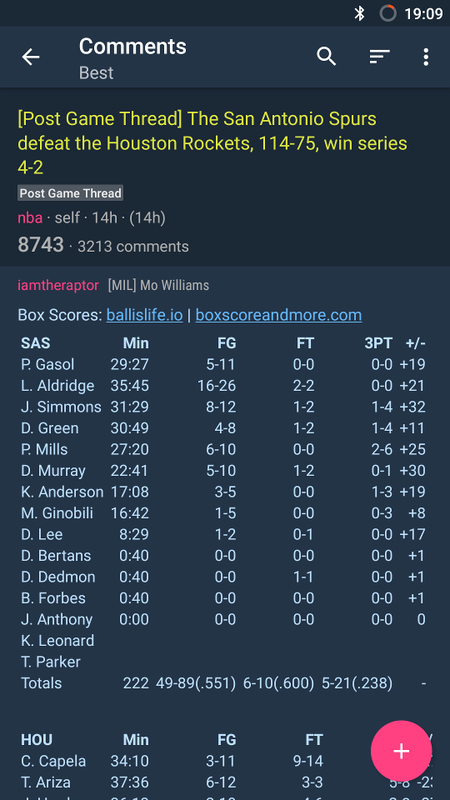 Mixtape videos will open in Legacy player to avoid playing issues. It seems that ExoPlayer can’t handle mixtape mp4 enconding. And more… thanks for your help! 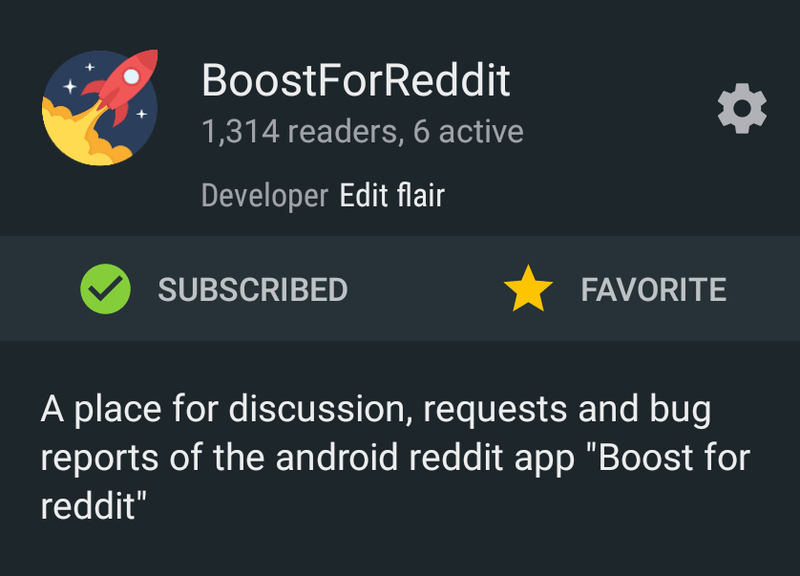 Boost for reddit 1.3.0 – Mod tools! 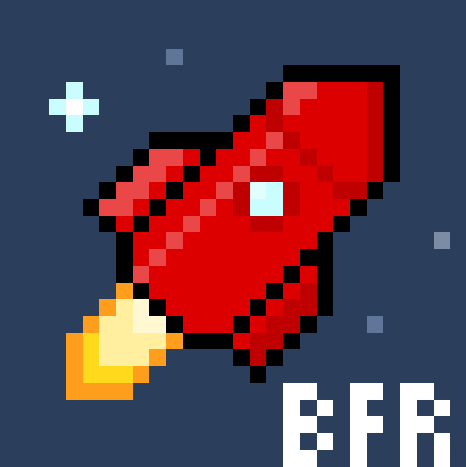 Version 1.3.0 has been uploaded to Google Play. 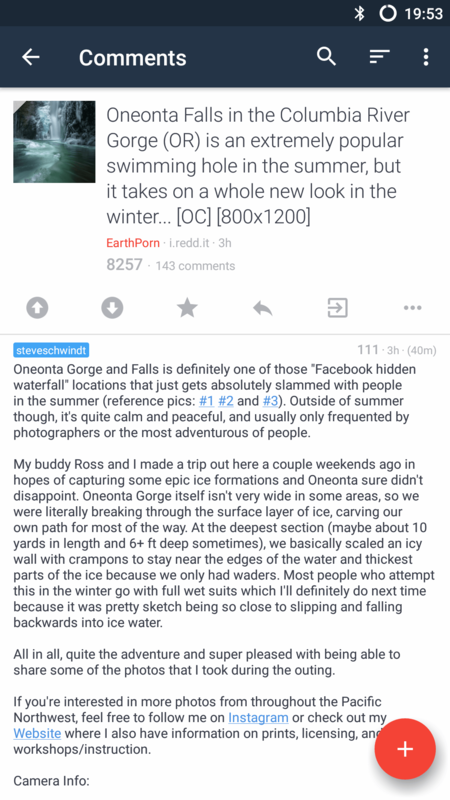 All operations are available anywhere you see a post/comment from a subreddit you moderate. 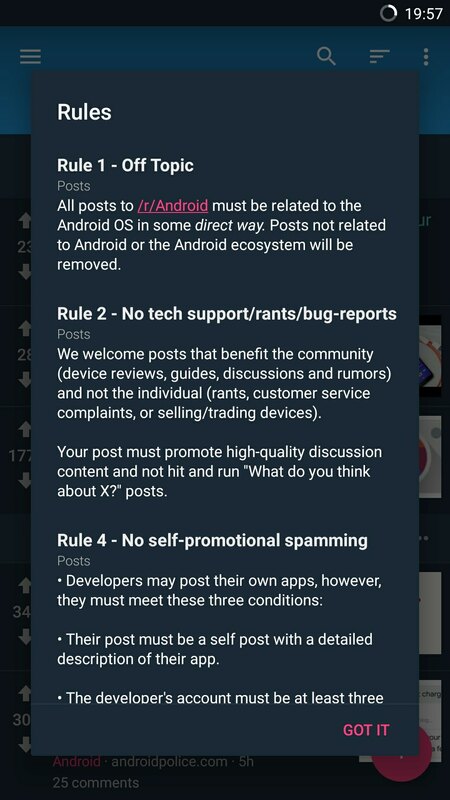 Approved/removed posts will show indicator only visible to moderators. 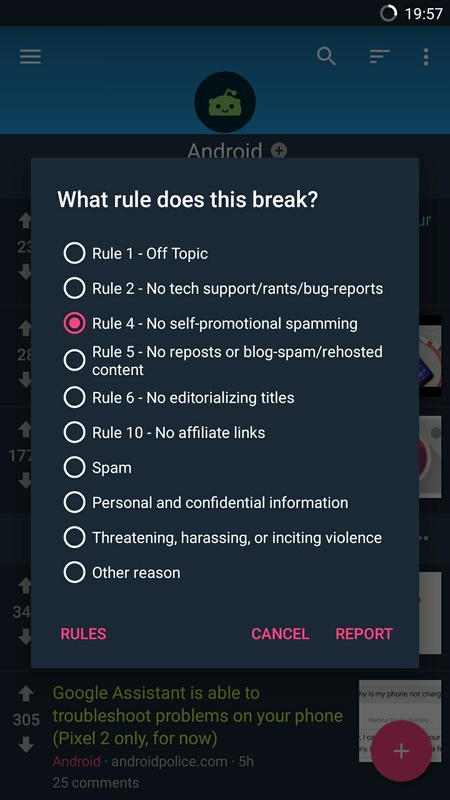 1 Ban users and moderation log requires a new permission. 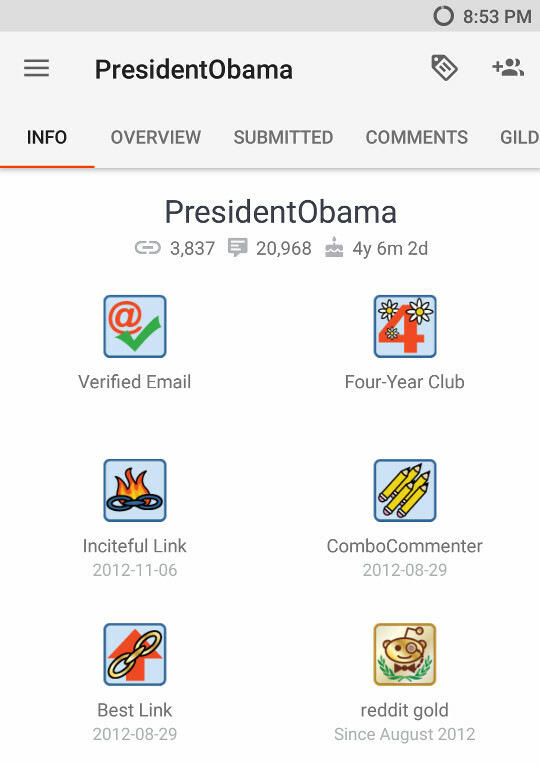 You’ll be asked to reauthenticate with reddit. 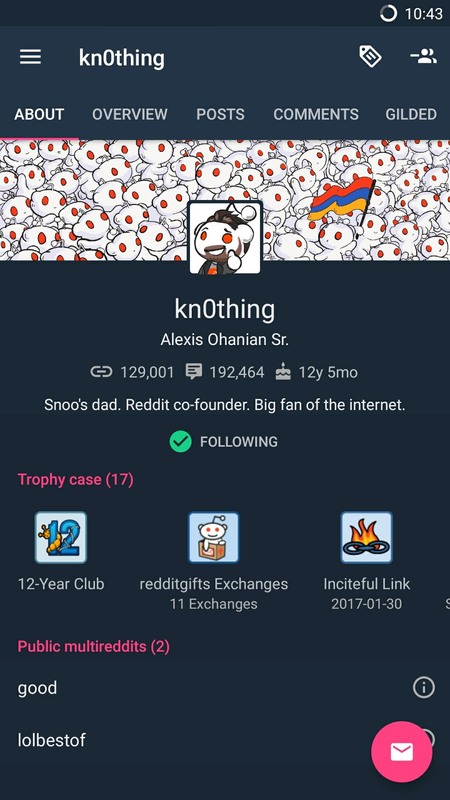 Are you a moderator? 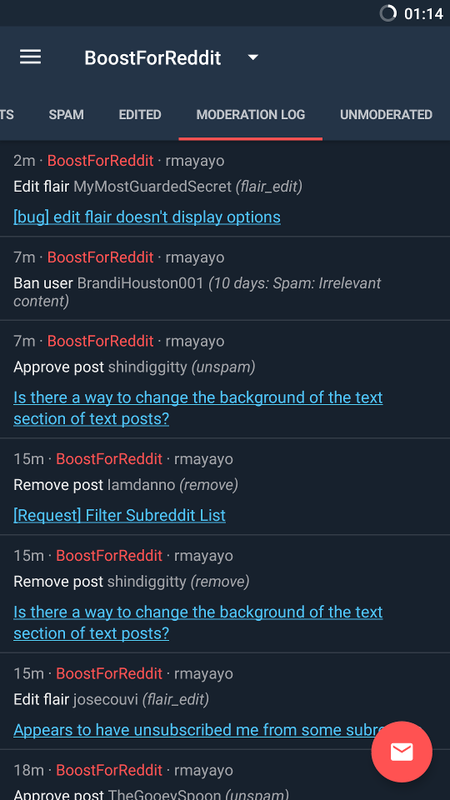 Since I’m still getting used to how this moderation thing works, your feedback is highly appreciated. 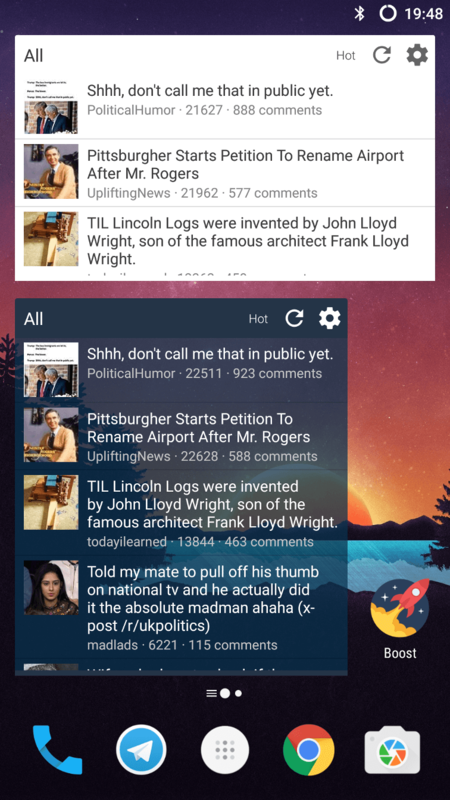 Added r/popular: Available in subscriptions list, widgets and lateral menu. 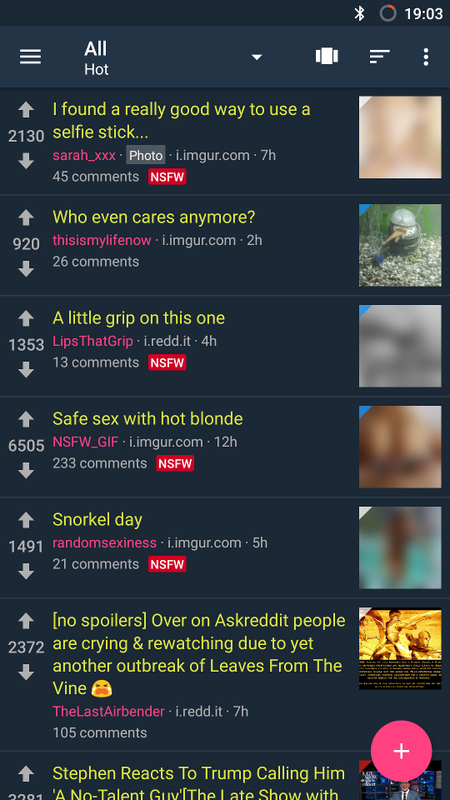 For logged out users, frontpage is replaced by popular. 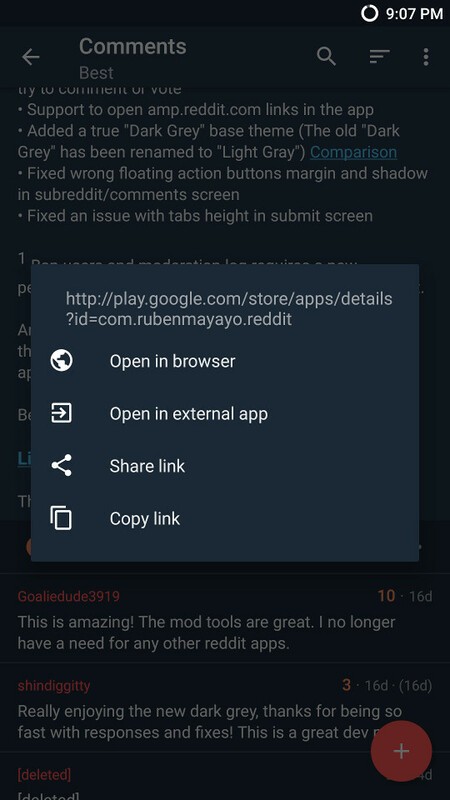 If you don’t like popular, remember that you can hide elements from the lateral menu in Settings-Menu. 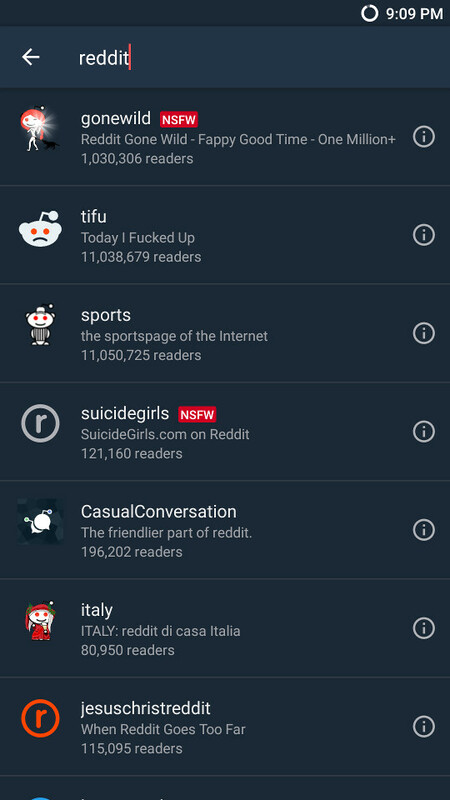 If you don’t want it on top of your subscriptions list, go to Subscriptions, long press “Popular” and select “Move to bottom”. 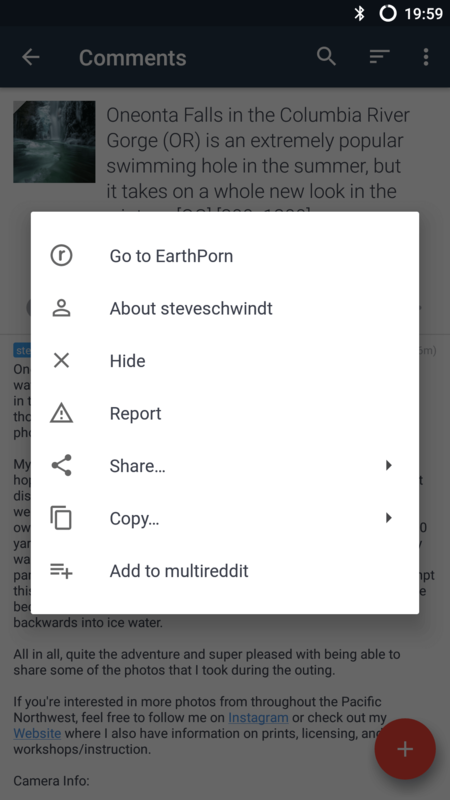 If you add one of your private multireddits to the widget, it will only show posts if the user is logged in. 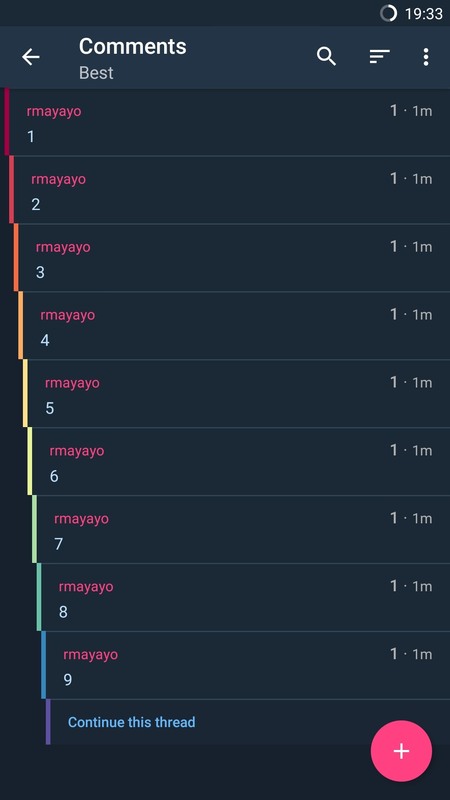 An empty list will be shown otherwise. 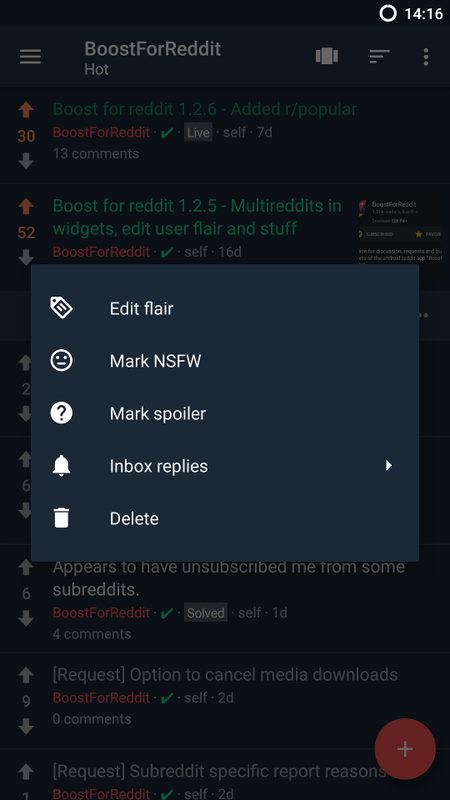 Boost for reddit 1.2.4 – New menus and many improvements! 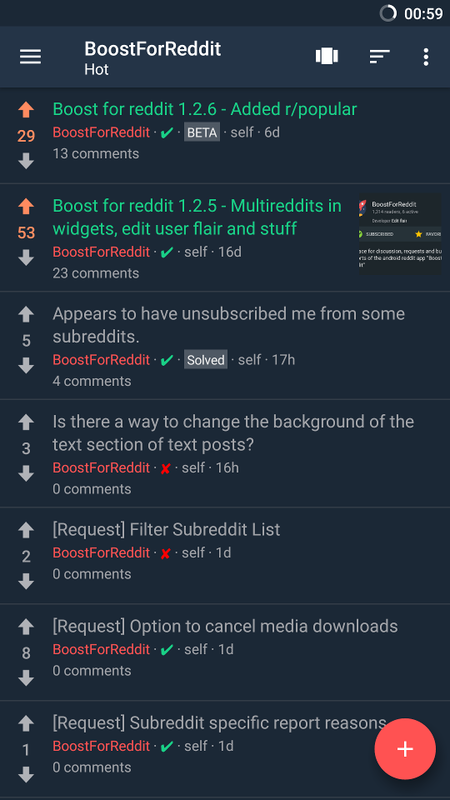 Share Boost with other redditors and spread the word!